Cindy Liebel Jewelry creates designs that combine the relationship between unconventional, eco-chic and mid-century design. focusing on traditional and modern processes. While her background in fine arts and photography influences her creativity and visual storytelling, she is dedicated to creating jewelry that reflects individuality. The arc style threader earrings are long, accented with curves of tiered bands showcasing asymmetry. Slip on and go with these earrings as they drape with ease. These earrings are bold and sleek to contour your look that is effortlessly stylish. 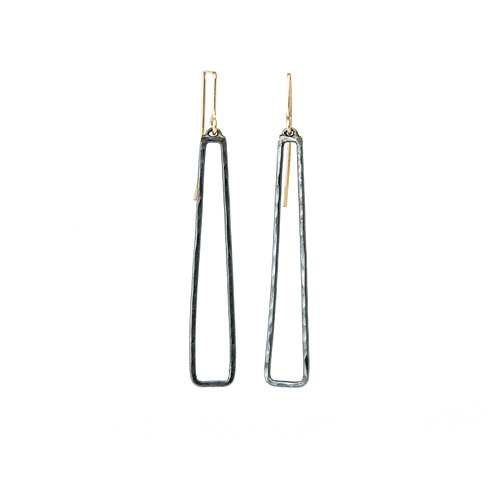 Geometric threader earrings present a stepped, zig zag feature in its design, elongated to sway effortlessly with pride. 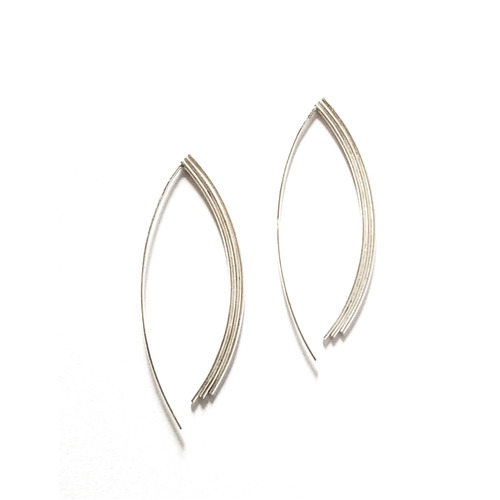 Minimalist design and bold features set the tone in these art deco styled hoops. 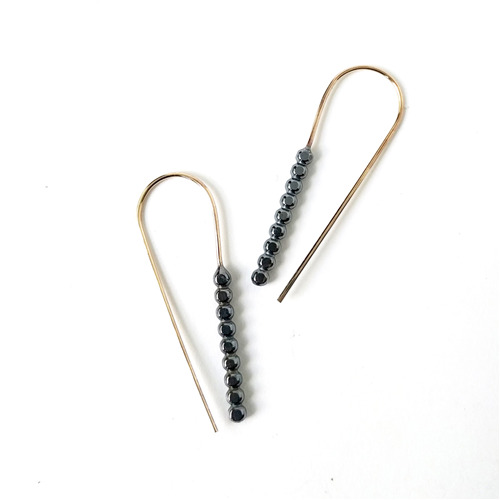 Your on-the-go slip-on earrings for everyday wear with intention. Available in two sizes, petite and tall. These earrings feature nine silver beads, adding a touch of whimsy to the classic threader hoop. The earrings are lightweight and comfortably fitting for any occasion. Available in two sizes from small to medium and metal finishes from polished silver to oxidized & gold-filled. 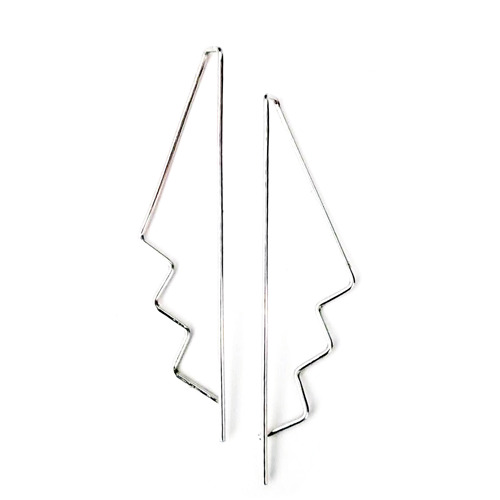 The Trireck Link earrings are long trapezoid design, accenting a sleek design. The geometric earrings are bold and add personality to the contemporary style for any occasion. Available in polished sterling silver, oxidized and 14K gold-filled and 24K gold accents. 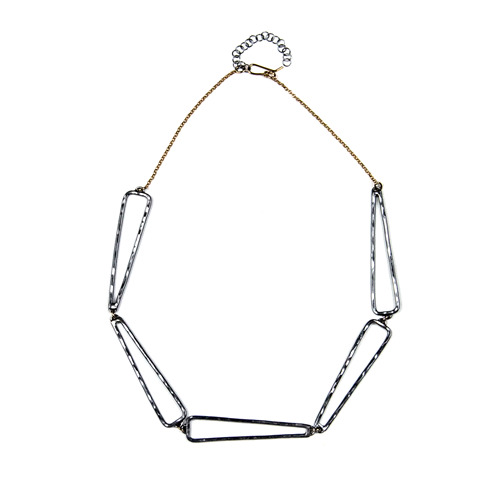 Chain linked necklace is handcrafted with long slender geometric trapezoidal links, shapes this statement piece into a bold, contemporary design. Each link is accented with hammered textures adds a little sparkle when the light catches. The necklace is lightweight and easy to wear. 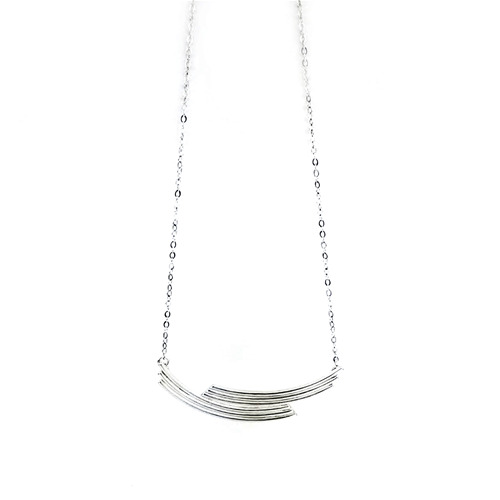 Bold necklace encompasses long two-tiered curved charms, curved softly, forming the arc style pendant. The connection between the two elements adds a sense of calm and dramatic presence. Intended to wear long or at the neckline, contouring your style. This necklace has a nice weight without wearing your down.